Hi, my name is Jacky and I have lived in both Hong Kong and Macau. My friends call me a street-sider as I always love exploring the small details of inner city living. I think this has something to do with growing up in the city of Melbourne, where venturing down little lanes often mean you find yourself in a different world. As someone with 10 years of hospitality experience, I consider myself a young, knowledgeable and resourceful guide who excels in creating special tailored itineraries. 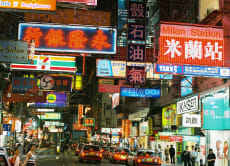 If you want to go off the beaten track and have a uniquely authentic experience, come explore the streets of Hong Kong with me.